The living room is part of the house that seems to be taking the longest to do. We spent a long time sitting on sofa beds in a room lit up by only a small lamp. But as time has gone on it has slowly taken shape. Firstly we stripped all the walls and got the ceiling plastered. Then painted the ceiling and glossed where we needed to. 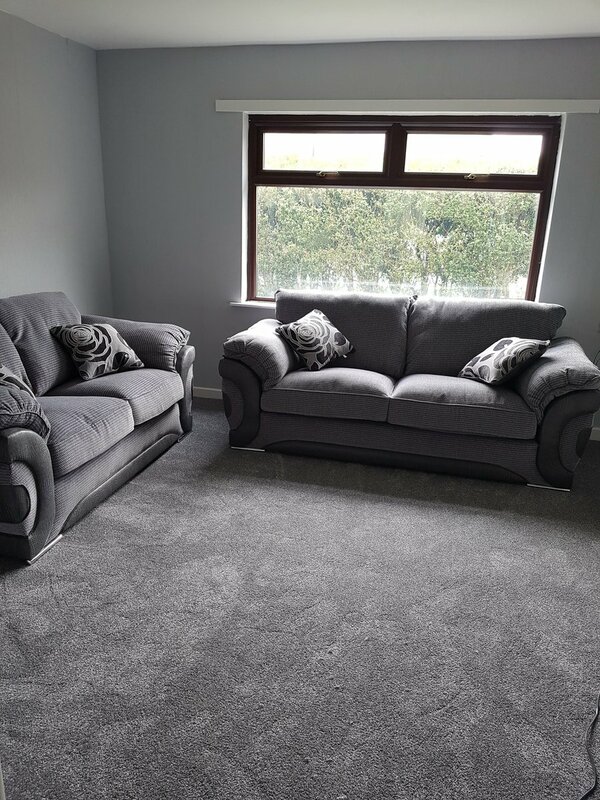 Liam's mum then came and did the wallpapering for us which looks absolutely amazing, then it was time for the carpet to go down, I think I picked the fluffiest one they offered. We were lucky that we had the sofa arrive a few days before the carpet so once this was down Liam put the sofas in place. My dad and Liam then fit the new fire place for us. At one point I was stressing as there was just a big hole where the fire should be however, once this was fit it has made it look a lot nicer and I am happy to actually sit downstairs. Since the above picture was taken we have hung some curtains, fitted new lights, added some side tables and accessorised the room. I am so happy how our house is slowly coming together and I don't think it will be too long until we are fully done to how we want it all. I am loving how the colours in the room are going so well together as honestly this is the first time I have ever one anything like this, even old bedrooms I just said colours that never went together but others went along with it. We still need to hang our pictures, put a shelf out for my Disney ornaments once we decide which are going in here and which are off in the dining room. We need to wallpaper the boxing in and paint other parts and add a little bit of skirting along with changing sockets and fitting a door. I also want to get a blu-ray player to have in here so we can get comfy and watch films instead of hiding out in the games room. I will be sure to post more pictures once the room is completely done which shouldn't be too long and actually tidy for a change so make sure you keep checking back. I will also be putting up a dining room post very soon.